This is a quick post for my entry in the Muse DT call. They say for the entry you can enter something old or new. I scrolled through my flicker account to see if there was one that I had done already to use. I came across this card that I never posted and thought it was perfect. 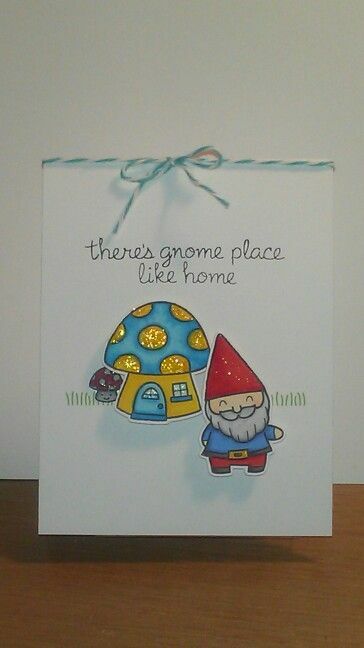 I love the gnome and his mushroom home! 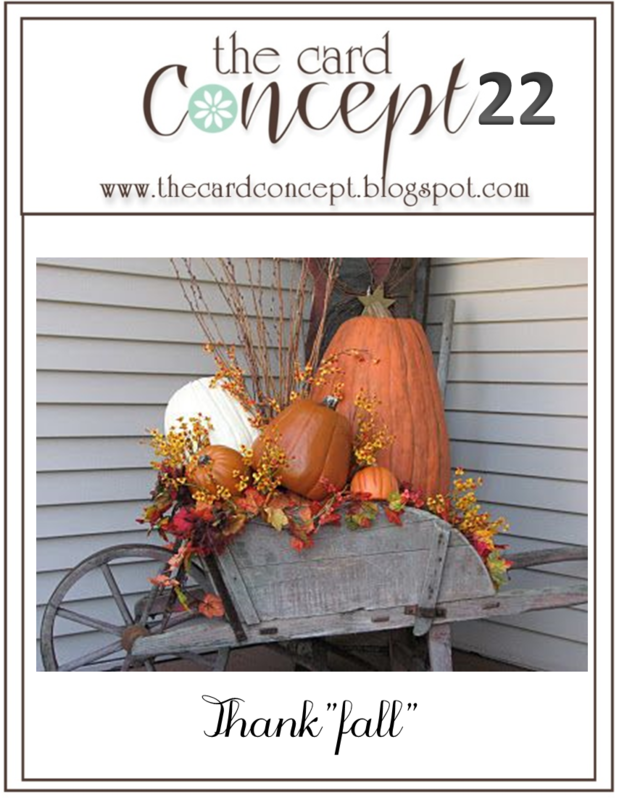 Lawn Fawn has some of the cutest images! ;-) The call is running until the 11th of December for anyone that would like to go for it, or if you'd like to help pick a winner voting starts on the 12th of December. Anyone can vote for up to 3 cards. There are already quite a few wonderful projects entered. It'll be a tough decision for the voters. Good luck to all that enter!!! 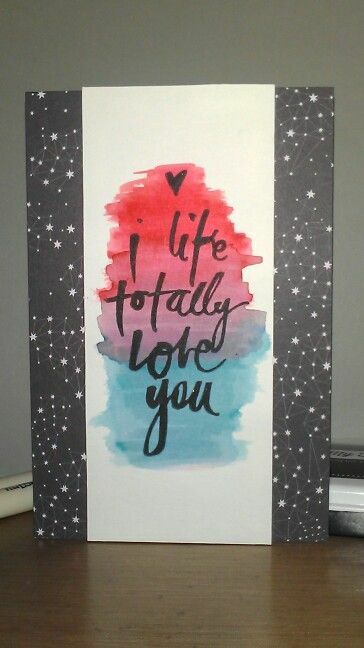 Today's card I made for my hubby. Wednesday is our anniversary. This stamp cracks me up cause I totally see the word life instead of like, so which means it's probably how I he'll see it too! 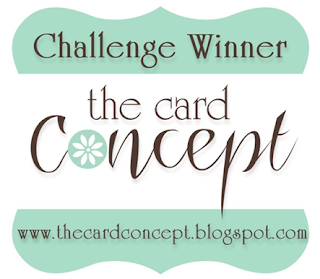 I will add this card to Simon Says Stamp challenge blog. Thanks for stopping by, have great day! Here with another card with a blue and gray/silver look to it. Last night while catching up some of my recorded shows I decided to pull out a neglected stamp set and play with my watercolors. I've been watching some videos on the WPlus9 YouTube channel and was very inspired! She is awesome. I'm no budding watercolor painter for sure, but I thought it turned out pretty decent! 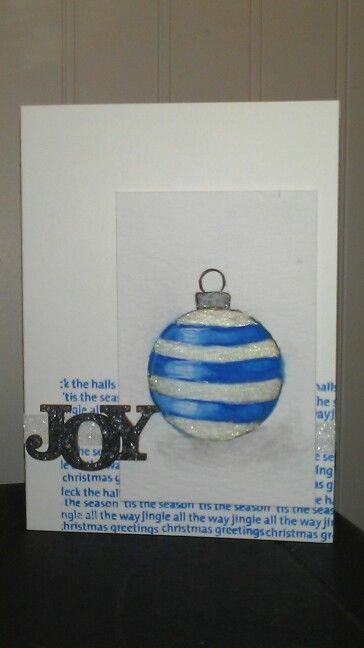 I love blue and white with sparkles! Thanks as always for stopping by. Hope everyone is staying warm and enjoying the weekend! I made a card based off of the Fusion Card Challenge. 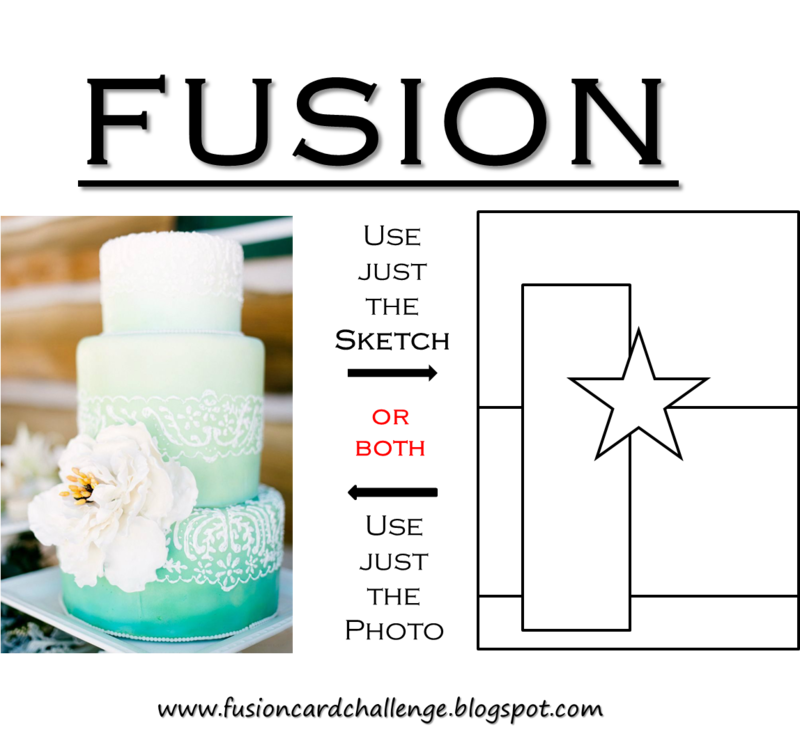 Love the ombre and embossing on the cake. 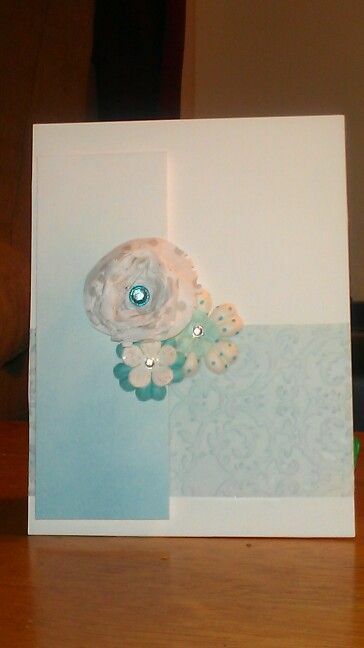 I did go a little out of my element on the card by adding the flowers to mimic the cake. I also followed the sketch . Using distress ink (Broken China) I tinted the vellum (bottom panel) and gave the other panel the ombre look. I then embossed the vellum panel with the cuttlebug and rubbed the distress ink over the embossing. ( Not easy to see in the picture) The big flower I made cutting and rolling a doily, adding gems to the centers for a little sparkle. Thanks for stopping by, have a fantastic Friday! 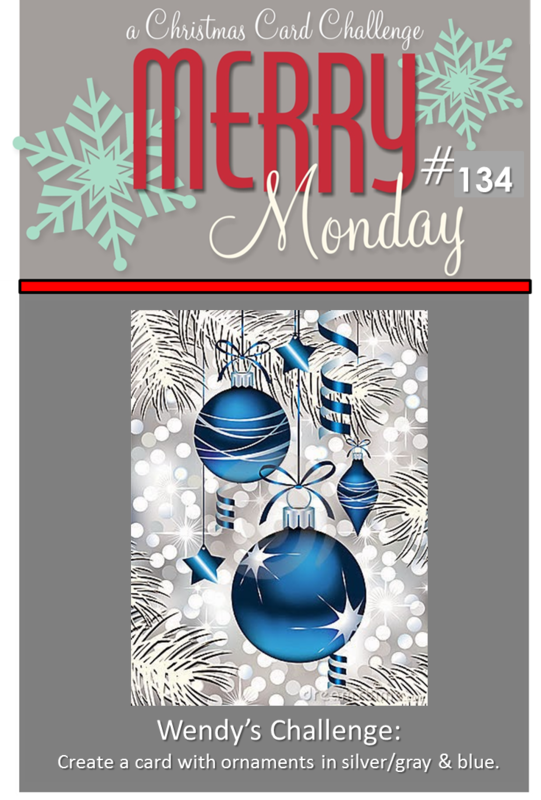 I'm posting today to share a card I made for the Merry Monday challenge #134. 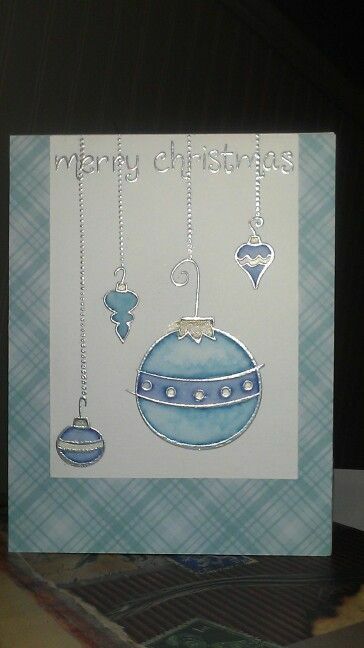 I embossed the ornaments in silver on water color paper. I watercolor them with distress markers. Just for a little more shimmer I used the Perfect Pearls as watercolor for the white areas. I have a card today made with a Hero Arts set that I got from work last year. I've been waiting to use one of the houses from it. 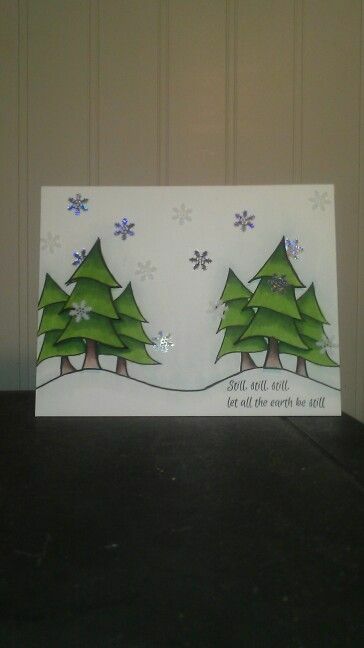 I attempted to make a serene winter scene and add glitter using some glossy accents. Also I purposely colored out of the lines on the Christmas lights to look like they were glowing. 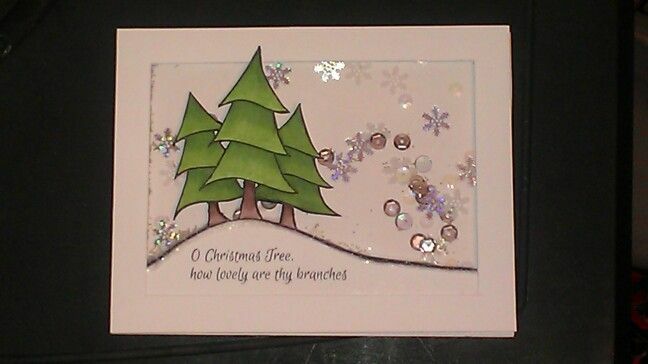 I will be adding this card to the Hero Arts Holiday Challenge for the anything goes theme. 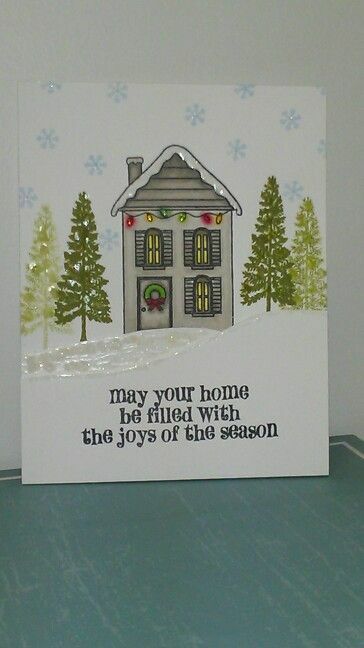 I still have plenty of holiday cards to make so hopefully I will get more done to fit along some of the other themes they have going on the blog challenge. I got the Lawn Fawn So Thankful set earlier this year and hadn't used it yet. 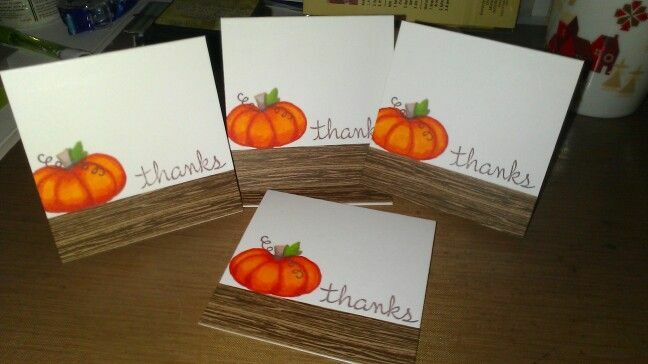 The pumpkins are the perfect size for a mini card. To make the cards I just folded a 6x3 piece of card stock (110 lb) in half and added the a woodgrain washi tape at the bottom. 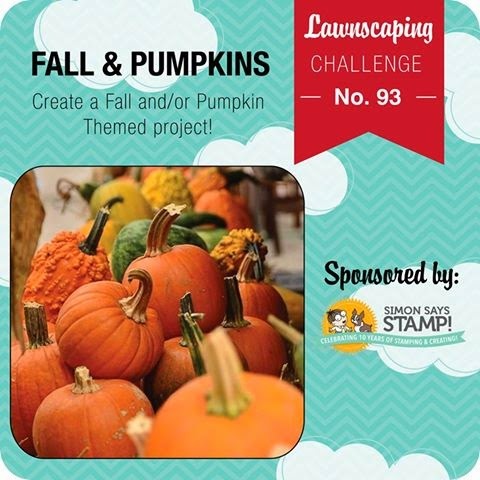 The pumpkin and leaf images were stamped in Desert Sand Memento ink and colored with copics. The curly vines and sentiment were stamped using Memento Luxe in Rich Cocoa. I didn't saturate the paper to much with the Copics so the bleeding was very minimal.